Innovations in a compact size! It is a compact and multi functional spy bug detector which replaces BugHunter Mini. Frequency range is expanded and now is from 10 to 3,500 MHz and it is dynamic. The device is based on the professional model BugHunter Professional CR-01 but has less functions and shorter detection range. Its unique size allows to take it anywhere with comfort, it is smaller than a credit card. Our engineers developed a new compact housing with a built-in antenna and custom software to lower the cost of BugHunter Micro. Despite the lower cost the quality of spy equipment detection improved significantly. Unlike BugHunter Mini, it has two modes — Search and Search with acoustic binding (echo location). It does not have Security mode like our more expensive professional devices but it has a professional element base from Analog Devices in its core. We replaced the telescopic antenna of BugHunter Mini with a new one integrated in the housing of BugHunter Micro. As a result, the new model vastly surpasses BugHunter Mini and comes very close to much more expensive RF signal indicators. 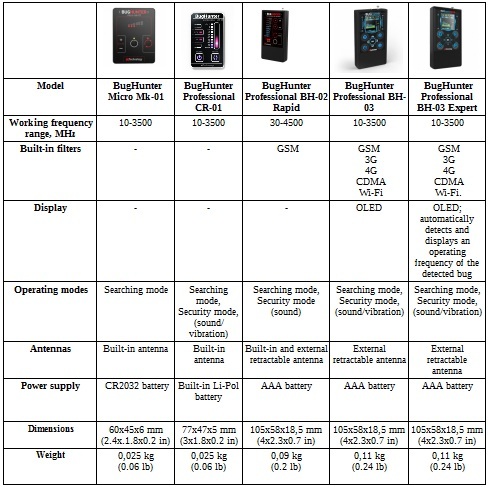 BugHunter Microis a portable device designed to detect radio transmitting devices in close proximity: wireless spy bugs, radio microphones, hidden wireless video cameras, two-way radios, switched on cell phones, cell phone jammers and suppressors. Our device complies with all acting standards and it has passed all necessary tests and examinations.